About 70 players from 13 teams will participate in the National Tennis Championship that will begin tomorrow in Đà Nẵng City. 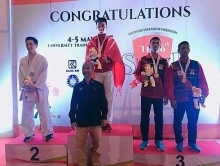 They will compete in five categories, comprising the men’s and women’s singles and doubles and mixed doubles at Thanh Niên Court in Hải Châu District. 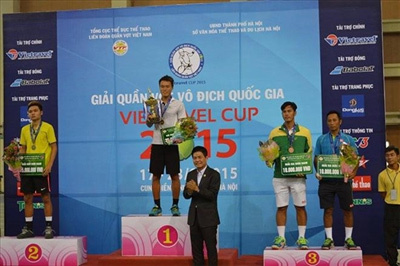 The Việt Nam Tennis Federation said the winners of the championship would qualify for the international Vietnam Open tournament that will be held in October and the tournament for top players in December. The federation officials will also select members of the national teams that will take part in the Davis Cup, Fed Cup and Southeast Asian Games in 2017. Apart from points, the winners will also receive cash bonuses. The matches will be aired live on Thể thao TV and Thể thao Tin Tức HD channel every day. Last year, Phạm Minh Tuấn of Đà Nẵng defeated Hà Nội’s Trịnh Linh Giang to win the men’s title. Trần Thị Tâm Hảo of HCM City beat Lian Trần of Becamex Bình Dương to win the women’s event. HCM City’s Đỗ Minh Quân and Lê Quốc Khánh won the men’s doubles. Hảo took her second gold in the women’s doubles, pairing with Sĩ Bội Ngọc. Thanh Hoàng and Kim Ngân of Military won the mixed doubles event./.